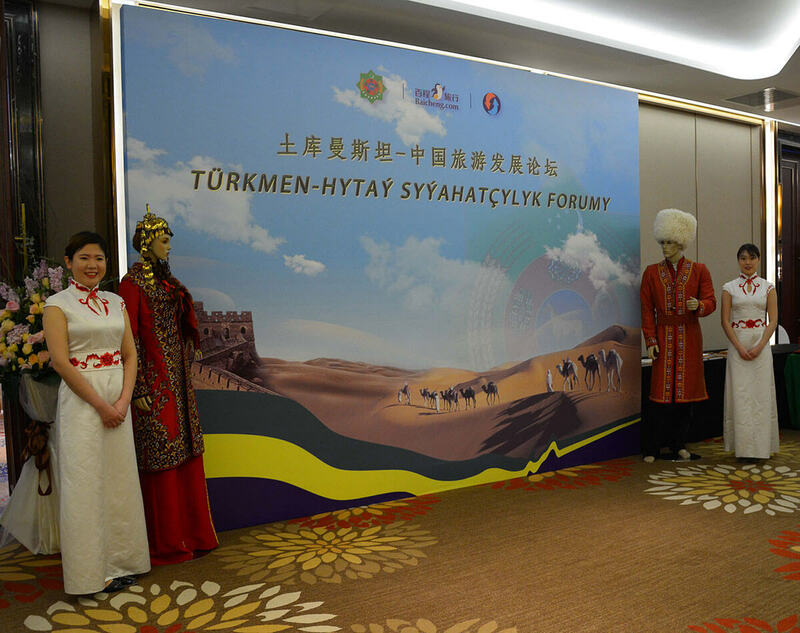 The Turkmen-Chinese forum on cooperation in the sphere of tourism took place in Beijing on February 2. The forum was organized by the Embassy of Turkmenistan in the People’s Republic of China jointly with the State Committee for Tourism of Turkmenistan and ShuangSun and Beychen Chinese Companies. Those speaking during the forum opening ceremony underlined that President Gurbanguly Berdimuhamedov paid significant attention to the tourism industry that plays a crucial role in the socio-economic development of Turkmenistan, revealing the spiritual and cultural potential of our country and enhancing the mutually beneficial relations, the international exchange of experience in the sphere of tourism and health-improving and recreation sphere. The meeting brought together the representatives of the state structures, businessmen, marketing consultants, experts, air carriers, who specialize in the sphere of tourism, as well as Chinese media. The delegation of the heads of leading travel agencies and hotel business organizations of Turkmenistan arrived in Beijing to take part in the forum. The main goal of the forum is provide assistance to building up and developing the mutually beneficial cooperation in the sphere of tourism, establishing the system dialogue between the state authorities in this sphere, the business communities and profile institutions of the two countries, as well as popularizing and promoting the tourism potential of Turkmenistan in China. The meeting participants considered the status of the bilateral political, trade, economic and cultural relations, the prospects of their development given the top-level agreements and ambitious joint work, carried out by the government of our countries in various spheres that opens up wide opportunities for the development of transport communications and humanitarian relations. Addressing the forum participants, Ambassador of Turkmenistan to the People’s Republic of China Chinar Rustamov specified such key mechanisms for enhancing the tourism relations as the cross participation in the branch exhibitions and congresses, exchange of delegations, the organization of joint events and the implementation of investment projects. The businessmen of China got familiarized with the investment policy of Turkmenistan that creates the favourable climate for attracting the foreign capital, including in the tourism industry. The Deputy Director General of the Department for International Cooperation of the Ministry of Tourism of the People’s Republic of China underlined the importance of the joint forum in familiarizing the Chinese community with the great potential of the tourism sphere in Turkmenistan, establishing the direct contacts between the travel agencies of the two countries and increasing the mutual tourist flow. He emphasized that the forum served as the platform for launching and implementing joint investment projects in the sphere of tourism. Speaking during the forum, the President of the ShuangSun International Service Company put forward a number of specific proposals to enhance the partnership, in particular the organization of cultural and educational tours to see the historical and architectural sights in Turkmenistan and China, as well as our people’s traditions and heritage. The representatives of the tourism industry of Turkmenistan and China exchanged their views on such issues of cooperation as the development of special package tours for the people of China given their interests and wishes, as well as the promotion of the tourist products of Turkmenistan to the markets of the Celestial Empire. The opening of the visa application centre of Turkmenistan “Silk Road” that will provide visa support to Chinese tourists and companies took place in the framework of the forum. Moreover, the air ticket lottery was held on the occasion of the visa centre opening. The certificates for the free flight with the Turkmen Airlines from Beijing to Ashgabat and back were awarded to the winners. The Turkmen delegation also arranged the exhibition, providing a wide range of informative materials, souvenirs and promotional products, dedicated to tourism in our country. A number of contracts and agreements aimed at widening the mutually beneficial tourism business between Turkmenistan and China were signed up on the outcomes of the forum. The documents covered a wide range of the partnership areas in the tourism industry, including through various tourism events on the territory of the two countries, investments, training of personnel for the industry and exchange of information.